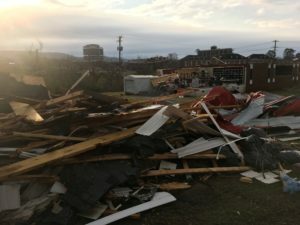 Severe winds and a double tornado damaged buildings in northern and eastern Alabama on March 19. Jacksonville State University was hit pretty hard but thankfully students were on spring break and away from their dorms. Volunteers have been working around the clock to remove debris and clean up. 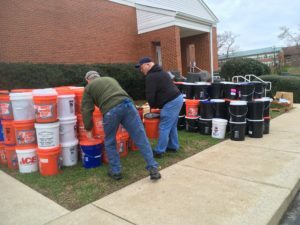 We partnered with First United Methodist Church of Jacksonville, AL as our local distribution point and within five days, we arrived with 150 buckets. Thanks to all who donated items and monetary gifts to help the folks in Alabama.